Not wanting them to think that I was deprived in any way, I had taken some samples of what I normally eat with me – Gigantes in vinaigrette, tri-colored chickpea salad, roasted veggies (eggplant, zucchini, and summer squash) with Greek seasoning and a kiss of Parmesan, tofurkey Italian sausage with caramelized onions, sautéed sweet peppers, Portobello mushrooms and spinach. I also took grape tomatoes, sliced cucumber and carrots to dip in edamame hummus. It was a feast! And they agreed that I’m not depriving myself of anything. Here are some of the packaged foods I’ve found to augment my roasted or sautéed vegetables, nuts and beans. Tofurkey Italian sausage – I’ll be the first to admit that the name “tofurkey” is just ridiculous. In my opinion, it doesn’t taste like either turkey or Italian sausage; but, I do like the flavor with the peppers, onions, mushrooms and spinach. The texture of it is a little weird, though. It feels like the “meat” in canned ravioli. 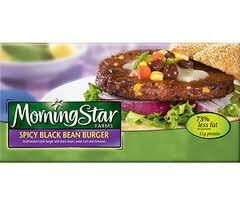 I’ve tried several Morning Star frozen patties: Maple Flavored Sausage Patties, Mediterranean Chickpea, Grillers Prime, Roasted Garlic & Quinoa, and Spicy Black Bean Burger. Although all of the varieties contain some kind of wheat or wheat gluten, there wasn’t enough in there to upset my system. Maple Flavored Sausage Patties – These are a nice addition to my morning hot cereal from time to time, although I’m going to see if they have another kind that doesn’t have the maple flavor, which is just a little too strong and chemical tasting for me. They are a little on the dry side and are kind of chewy; however, that’s like normal patty sausage in my house since I usually overcook it. Each patty has 10 grams of protein, 80 calories, and contain egg whites. Mediterranean Chickpea – Now these are tasty! They have a nice texture and the color is something like a chicken patty. I like the herbs and spices in this one, which I served with caramelized onions and a side of beets. I’ll get these again. Each patty has 10 grams of protein, 110 calories, and contain egg whites. Grillers Prime – These look like hamburger patties and might be better if cooked on a grill and served on a bun with traditional burger condiments. As it was, I heated them and at them on a plate with veggie sides. I was not impressed. They are really dry and the inside looks like wet cardboard pulp. I also tried eating them with the caramelized onions and all, which was better; but, I still won’t buy these again. Each patty has 17 grams of protein, 170 calories, and contain egg whites. Roasted Garlic & Quinoa – These were pretty good. The texture reminded me a lot of the salmon croquettes my mother made when I was young. The flavor is a little on the mild side; but, I liked it. I’ll buy these again, too. Each patty has 7 grams of protein, 130 calories, and contain no egg whites. Spicy Black Bean Burger – These are my favorites and I’m going to have to figure out how to make them on my own. The flavor is really good and the texture is good. I ate them with just a little salsa on top and loved them. Until I can come up with a recipe of my own, I’ll buy these again! Each patty has 10 grams of protein, 110 calories, and contain egg whites. Edamame hummus – I’ve eaten regular hummus for years and love it. I bought this just to try something different. The taste is phenomenal; however, my body had an adverse reaction to it. I’ll just say that I will eat this only when I’m going to be by myself, outside in a stiff wind. It is not a food for me to eat in confined spaces. 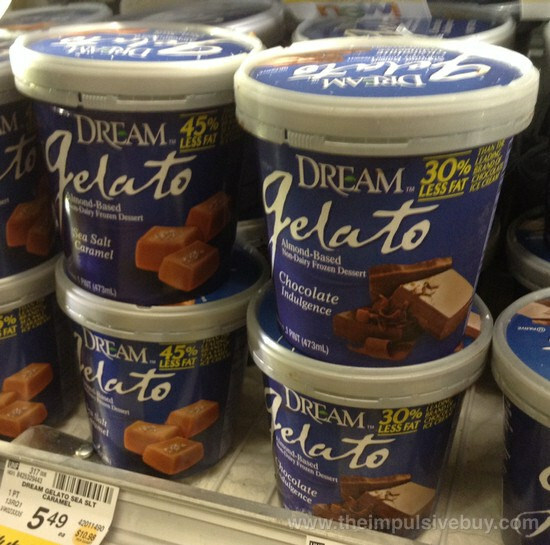 My favorite find for processed vegetarian or vegan food has been, hands down, Dream Salted Caramel Gelato. This stuff is fantastic! It has the texture and flavor of dairy gelato and is, without question, a certain repeat purchase for me. I’ve been both surprised and thrilled to find some processed foods to add to my legume, fruit and vegetable plates. While these foods do contain a good bit of sodium and have the danger of being too convenient, they are nice additions from time to time. I won’t keep a freezer full of them because they are so convenient. I can easily see how I’d end up popping the patties into the microwave and eating them alone rather than eating a balanced diet with lots of fruits and veggies. Still, it’s nice to have the option. ← Exactly HOW is this better?